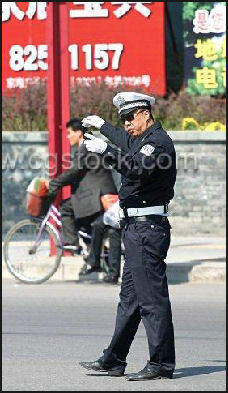 Traffic cop The main national police force in China is the People's Armed Police (PAP). While the People's Army has been reduced in size in recent years the People's Armed Police has been expanded, in many cases with former PLA soldiers, many of them trained in riot control. The rise of the PAP illustrates that the Chinese leadership in many ways is more concerned about domestic security than foreign threats. The PAP was created in the 1980s to deal with domestic disturbances. It acts as riot police and guards government compounds and foreign embassies. It usually handles border defense but is called in sometimes to back up local police. It recent years it has been put to work suppressing anti-government protest of over land seizures, environmental problems, workers uprisings and other protests. The PAP has developed tactics that have allowed them to defuse tense situations without having to resort to violent crackdowns. Deng Xiaoping pointed out soon after the 1989 Tiananmen Square crackdown, the PLA and PAP were a "Great Wall of Steel" that safeguarded the CCP’s power and prerogatives. The Public Security Service (PSB) is both a local police and the Chinese equivalent of the KGB. There are also paramilitary armed police and more than 1 million security guards in China. Police on the mainland and in Hong Kong have worked together to track down kidnap victims and break up a multi-million dollar loan sharking racket. The 700,000-member People’s Armed Police is a paramilitary force whose duties include guarding embassies and putting down riots. It is commanded jointly by the Defense and Public Security ministries in close coordination with Communist Party leaders, in particular the leader in charge of security in the Politburo Standing Committee. In December 2008, the Chinese government announced the creation of a new special unit aimed at cracking down on gun-related crimes and organized crime such as organized prostitution, gambling, drug production and trafficking. 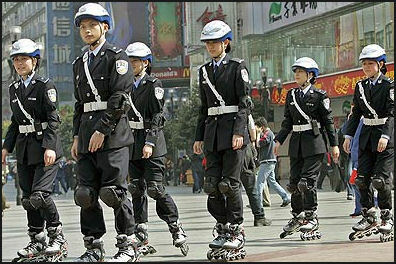 The chengguan (City Urban Administrative and Law Enforcement Bureau, also known as City Urban Administrative Enforcement Bureau in Chinese) have a notorious reputation, with many regarding them as little more than thugs. They are feared and despised for their capricious crackdowns and penchant for violence. They employed to deal with low-level crime and disorder and responsible for cracking down the street vendors, hawkers, and even the shoe shiners in the streets and are known harassing migrant workers, minorities and people they deem as suspicious, and detaining them is they lack the right residency permits. "To many, the officers embody all that is wrong with authority figures in China: impunity, abuse of power and disproportionate targeting of the poor," Pierson wrote. "It's why a kebab cart owner who stabbed two chengguan to death in 2009 after they attacked him was largely heralded online as a vigilante hero. Victims of chengguan violence have included a watermelon peddler who was paralyzed and a construction company boss who was killed after he dared to film the chengguan trying to stop a protest. One chengguan showdown with street vendors set off a three-day riot involving thousands in Xintang that was sparked when chengguan reportedly beat a pregnant roadside stall owner. Critics have often blamed poor training, pay and prospects for the lack of good recruits. But extracts from The Practice of City Administrator Law Enforcement “by the Beijing City Administration Bureau” explicitly advise them on using violence (See Law Enforcement Textbook Below). Such was the case on a recent afternoon in southwest Beijing, where clothing vendors were interrupted by shouts of "Chengguan! Chengguan!" Within seconds, many had packed up their merchandise and fled. One of them wasn't fast enough and was still there when a lanky officer surnamed Yan showed up and patted her on the shoulder. "It's better you go home early and hang out with your family," he said. The vendor thanked him and peddled away. Asked why he let her go, Yan said, "I'm also human. It's hot and most of these people have to do this" to make a living. As for the merits of his profession, Yan said, "This is not an easy job. I won't let my son take the same job when he grows up." "Our job is to deal with society's most vulnerable citizens and squeeze them further; conflict is inevitable," writes the author, who says he earns $185 a month, about the same as a construction worker. But "the vulnerable are not necessarily innocent. The sympathy these illegal vendors get has, to some extent, made the vulnerable privileged while we chengguan have become the humblest of the humble." The chengguan have faced a difficult task ever since they were established more than a decade ago to streamline the role played by myriad departments in enforcing municipal codes on ever more crowded streets. China Labor Bulletin, a nongovernmental organization based in Hong Kong that is known for its support of factory workers and laborers, issued a translation of the essay and a commentary, reasoning that there would be less conflict if chengguan were better trained and paid. Though the essay could not be verified, the organization noted that its details were consistent with past reports. "Chengguan have a uniform but no real power," China Labor Bulletin said. "They are supposed to enforce about 300 legal articles and regulations, but are given no specific instruction on how to enforce them. The only sanctions they have are fines and confiscations. However, these are precisely the penalties that are most likely to trigger a violent confrontation because, for impoverished street vendors, a fine or confiscation of their property means a loss of income and in many cases is a direct threat to their livelihood." Among the indignities was watching a colleague getting kicked in the groin by a shopkeeper, having a vendor pretend to lay dead on the ground while his son threatened to post a video, and riding to work in a rickety $300 minivan pulled from the scrap heap. In some cases, the chengguan are themselves the target of violence and retribution. In July 2011near the city of Wuhan, a chengguan supervisor was bloodied with batons by private security guards after he and fellow officers tried to confiscate chairs and tables blocking traffic. Chengguan in the factory town of Shenzhen were issued armored vests after a colleague was fatally stabbed by a peddler in April. “In recent years, President Hu Jintao has further expanded the power of jiwei by making their upper-level clearance a prerequisite for an official's promotion. In essence, jiwei now also hold the political careers of party and government officials in their hands. Some security guards have a reputation for being thugs and beating up on people that cross them. Many have no training. Some have ties with organized crime groups. Some are members of organization run by local police. Others are used by their employers as heavies to break up protests and collect money that is owed them. Attention was brought to the private security issue in 2009 when a journalist investigating a tip of a woman’s murder was beat up so badly by security guards he had to be hospitalized. The journalist said he was beaten for more then 10 minutes, resulting in severe neck and abdomen injuries. Photos showed massive bruises on his arms and neck. Top levels of security guards are known as bao an, or those who “preserve the peace.” They are required to undergo 240 hours of training before getting a license. There are many stories of migrant factory workers being shaken down, beaten and even killed by brutal auxiliary police. Private detectives and independent police often work harder and have better success than the police.. One man dubbed by "Zorro" by the Chinese press wears a uniform even though he is not officially a policeman. He works independently to retrieve women who have kidnaped and sold as wives. He rescued 100 women between 1992 and 2000. See Wild Yak Brigade, Nature, Tibet. In affluent cities such as Shenzhen it is becoming increasingly common for rich people worried about kidnaping, robberies and assaults to hire kung fu experts as bodyguards. Hei shehui (“black society thugs”) are hired by police to hand out extralegal punishment. A lawyer who endured a attack by these thugs said 10 men showed up in his office, threw a bag over his head, pushed him into the back of a car and took him to the basement of a house, where he was beaten and shocked with an electric prod for four hours and then driven to a forest and thrown from the car. The first detective agencies to open since 1949 opened during the early Deng era in the 1980s. Detective work is a growing business. As of 2004, China has 20,000 private detective agencies. Detectives are mainly involved in chasing owed money and finding lost relatives and friends. Some work for foreign companies, investigating fraud, doing background checks on Chinese partners and even raiding factories that produce counterfeit goods. Others are used to investigate corruption. Officially all detective agencies are illegal. In 2004 there was some discussion of making them legal. Many detectives are hired to check on spouses and lovers suspected of having affairs. Some of the most well-known ones use trick they learned in the secret police and Hollywood movies such as using networks of informants, laying traps and setting up stakeouts. Some charge as much as $1,000 an hour. One detective was called in by an American insurance company to investigate families accused of making false claims that members were dead. In some cases the detective solved the case by calling up the suspected family and having the “dead” person come to the phone. One well known detective warns judges that if they don’t accept their evidence he will investigate the judge.